A meditation chair provides comfort and relaxation. The styles and designs of a meditation chair vary, but each one provides back support and comfort while enhancing the meditation experience. In addition to chairs, meditation benches offer many of the same benefits with added room. Regardless of the type of meditation you practice, a chair for offers many advantages and benefits. Chairs are specially designed to provide proper back alignment and support to reduce the stress of sitting in one position for a long time. By sitting in alignment, extra pressure is removed from your back. There are many chair styles that offer solid, comfortable back support. These chairs are ideal for those who have back problems or suffer from limited flexibility. Many meditation chairs are lightweight and easy to move. Some designs fold up and become portable allowing you to take your chair for meditation comfort anywhere you desire. Whether you practice yoga meditation, mindfulness meditation, Zen meditation or any one of the different types of meditation, using a chair for your meditating sessions will make it more comfortable and relaxing. Chairs for meditation are an excellent tool for people new to the practice of meditating. The chairs help them to feel more relaxed and comfortable as they get used to the meditation process. Chairs for meditation are designed to keep you comfortable and relaxed during your meditation session. There are many different styles and designs made to accommodate people of different body sizes, heights and weights. Tilted at three degrees the backrest of the Seagrass provides the proper posture for meditation. The three-inch curve in the seat gives excellent knee support when sitting in the cross-legged position. 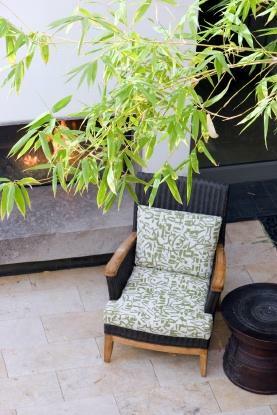 This chair features 2 cushions with removable cotton covers. The Ecopod chair for meditation is made from natural reed and is oversized for meditating comfort. This lovely chair makes a beautiful addition to any room. The Rama has an adjustable tilting mechanism to angle the seat forward slightly. The seat is oversized and provides excellent support. Weighing less then four pounds the Wanderlust Zafu has a built in carrying handle. Popular and sturdy Backjack chairs have a cotton material over padding with a frame made of lightweight steel. A folding meditation bench is offered by Mats Mats. The Tilt Seat is designed in the style of Shaker furniture and is available in small, medium, and large. Depending on the style of the chair, prices range from approximately $30 to $350, and different manufacturers may offer additional choices of chair and plain cushion styles. Whether you favor an ergonomically designed tilt chair, a softly padded rattan lotus chair or any one of the many other designs available, using a meditation chair is a wonderful way to enhance your meditation session.